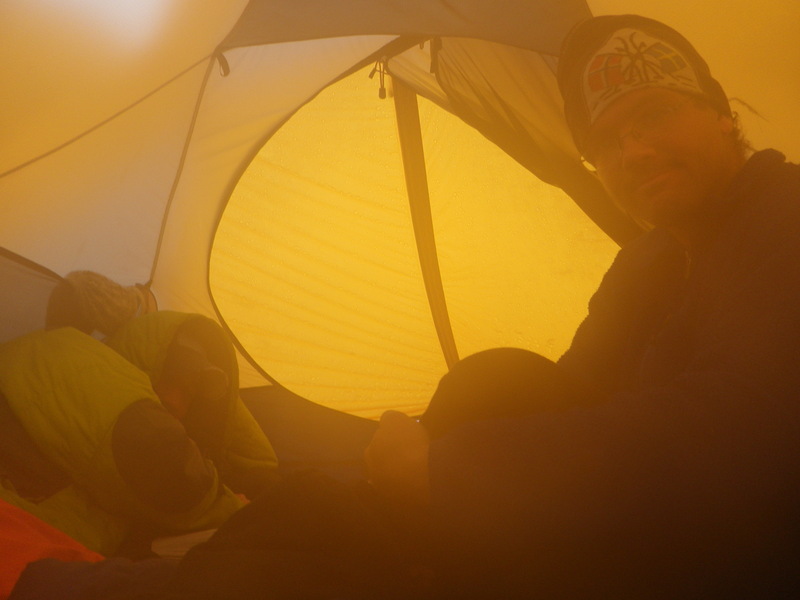 I woke up at 3:42 a.m. on May 5 and quietly unzipped the vestibule of my tent. It was calm, clear, and cold in the Talkeetnas for the first time in five days. In eighteen minutes it would be time to start melting snow for water, for today it looked like we would finally get a window to climb. For now, though, my two tentmates were snuggled in their sleeping bags like so many giant, cozy caterpillars. I suddenly felt a wave of affection for these people with whom I’d weathered the seemingly endless snowstorm. Despite our cramped quarters, our mutual excitement over the increasingly remote possibility of climbing had been enough to pass the time, and our spirits had remained high. Gil cracked an eyelid. “Visibility?” he croaked. We’d started to wonder if the cloud ceiling would ever lift. Before I could answer, Joe Stock’s voice burst into our tent with the same boundless enthusiasm as the man himself, shattering the frozen silence. This was enough to rouse my tentmates from sleep, and as we emerged from our cocoons, I couldn’t help but crack a smile. Today was our day. This was not the view I’d envisioned when I planned to spend nine days climbing in the Talkeetnas. Such is mountaineering. Back up for a second. I’m really lucky I ended up on this trip at all, actually. 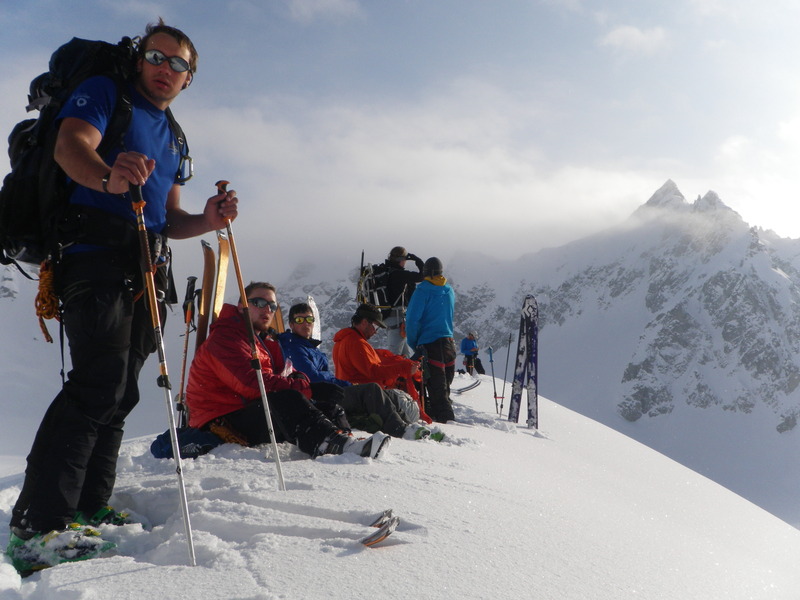 A brief run-in with some mild frostbite in January prevented me from taking the pre-requisite courses for Expedition Mountaineering, a month-long field course offered in odd-numbered years at APU. Because I am persistent (read: stubborn) and an excellent bullshitter, I managed to convince the department head I’d manage just fine anyway. Even once I’d secured a spot in the class, the trip itself almost didn’t happen. Nearly half the students originally signed up for the class dropped at the last minute, and then there was the matter of instructors: everyone qualified seemed to have made plans for May already. That’s the problem with mountaineers; there are too many adventures to be had. Despite the department’s weeks-long panic over instructors for the course, we ended up with an all-star cast. It couldn’t have worked out better, really. The department split the course into two sections. First, it was decided, we’d spend nine days in the Talkeetnas, climbing third- and fourth-class routes with Joe Stock. After only a few hours in the field with Joe, it was easy to see why he’s a big name in Alaskan guiding: he had us laughing hysterically for nine straight days, and at the end, I couldn’t believe how much we’d learned. 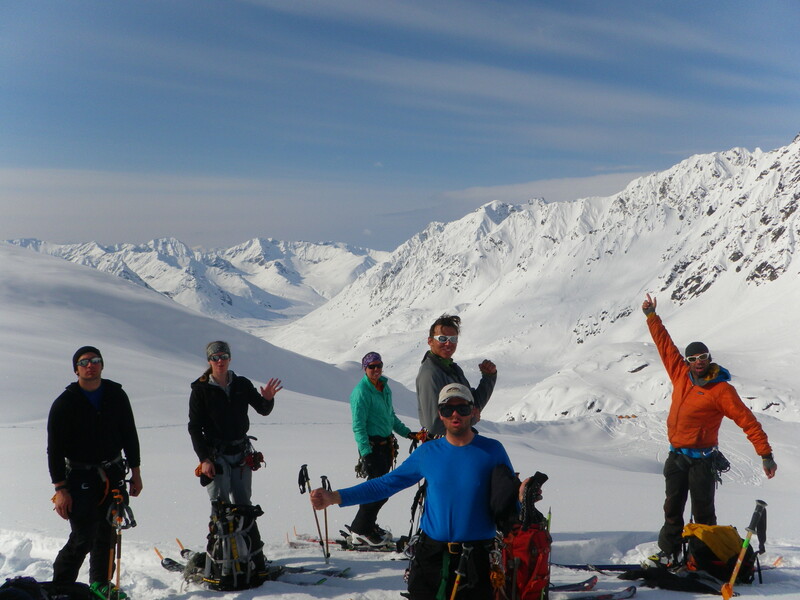 Heather Thamm, an APU alum and Alyeska ski patroller, would assist with that trip and lead a second trip, a thirteen-day traverse of the Harding Icefield from Skilak Lake to Exit Glacier, and she would be assisted by Mik Jedlicka, an Outward Bound instructor and fellow ski patroller (and, to my delight, CU-Boulder alum). Okay, back to the Talkeetnas. 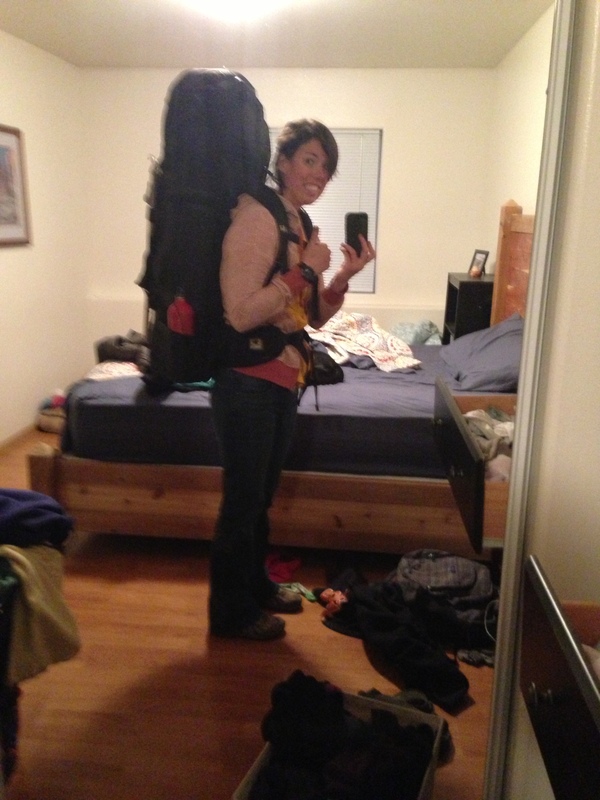 It doesn’t sound like very much fun to carry an 84-pound backpack, and you know what? It isn’t. But it doesn’t have to be fun to be fun. My pack tipped the scale at eighty-four pounds when we weighed in at the trailhead. I hate to reveal the specifics of my girlish figure, but that’s precisely sixty percent of my total body weight, which means my pack felt really effing heavy when I heaved it onto my back that morning. We skinned eight miles to a bench just below the Mint Glacier and set up camp just in time to watch a picture-perfect sunset. Our good fortune had apparently worn off by the next morning, though, because we woke to gray skies spitting snow. The soft, wet flakes turned to rain as we slogged our way up a steep couloir to the glacier itself, and when the terrain became too burly (or, as Joe would describe it, “rowdy”) to skin up, we strapped our skis to our packs and bootpacked the rest of the way. For those of you keeping track at home, my pack now weighed over 95 pounds. We spent the next four days in and out of our tents, emerging for classes on avalanche rescue, building snow anchors, and placing protection in ice, but otherwise cooking in vestibules and eating, reading, and sleeping in our tents to pass the time. Sometimes we put on our skis and did laps on a tiny hill near our campsite, just to get up and move. Everything was wet. I was obliged to think of my quasi-role model, Mark Twight, and reminded myself that it doesn’t have to be fun to be fun. Finally, on May 5, the storm broke. Everything had frozen during the clear, cloudless night, but we were too excited to care that our nose hairs were frozen. We cooked, ate, and dressed as quickly as we could, and by the time we’d finished our daily avalanche beacon check, Joe was halfway up the hill, putting in a track to the peaks neighboring our campsite. I felt like a kid in a candy shop: we were surrounded by some of the most aesthetically beautiful peaks I’d seen with my own eyes, and today, finally, we would stand on top of one. We’d set our sights on a small, unnamed peak just north of our campsite, which we’d nicknamed Ama Dablam. Its namesake is known as the “starter peak” of Himalayan climbing, so it seemed fitting for our first objective of the trip. Even without tents, sleeping bags, and food, all of which remained at base camp, our packs were heavy with ropes and gear, and it was pretty much a slog up the hill. The first few steps are always the hardest—Why is my pack so goddamned heavy? I always ask myself, Should my legs really feel like bricks of lead?—but you sort of get into a rhythm. Peter O’Toole was right: The trick, William Potter, is not minding that it hurts. At some point, I almost enjoy the dull throbbing of all the muscles in my legs. On days like this one, you can feel your body getting stronger, and it feels good. Our party makes its way up a slope on the first clear morning in five days. Base camp is in the background. I’d taken off right after Joe and crested the hill a few minutes after him, just in time to watch the rest of our party as they stretched their legs for the first time in days. Our campsite, perched on a bench overlooking the Mint Valley, looked like a postcard. We waited a few minutes for everyone to regroup, then marched on toward Ama Dablam II. Time for some foreshadowing. If you know anything about avalanches (or, alternately, if you know nothing about avalanches but possess some common sense), you probably realize that a lot of snow in a short period of time makes a snowpack less stable. In our case, four feet of snow had fallen in the last four days, an amount I would describe as “a lot of effing snow.” Things had crusted over pretty nicely the previous night, but on certain slopes, we were standing on a storm slab, which is exactly what it sounds like: a huge slab of snow created by one giant storm. You also don’t need to know much about snow science to recognize potential warning signs for avalanche danger. For example, if slopes around you are sliding, and those slopes are facing the same way as the one you’re on, it means there is probably some chance that you’re going to be sent tumbling downhill like a ping-pong ball and meet your untimely death suffocated under six feet of snow. The class takes a break before attempting Ama Dablam II. Joe, who pronounces the name of my home state “Colo-RAD, bro,” keeps us entertained. In light of the possibility of being buried alive in multiple tons of concrete snow, Joe Stock models what I’d call very conservative decision-making in the mountains. “You should always be looking for reasons to turn around,” he told us, and while it’s counterintuitive for people like us—people who have put the rest of their lives on hold because we want to stand on top of mountains—he’s right. If you’re really looking hard for a reason to shut it down and you can’t find one, go for it. Otherwise, it’s all about finding an acceptable level of risk. The sun started to beat down as we made our way, slowly but surely, up to the shoulder. We were working hard enough that the chatter had ceased, and all I could hear was the sound of climbers unzipping their various layers. And then, WHOOMPH. The snow under my skis settled considerably, and I could feel panic rising in my throat as the sound reverberated across the slope. It probably will not surprise you to learn that whoomphing, which is exactly what it sounds like, is a red flag for avalanche danger, as it means the snow beneath you is apparently not as solid as it looks. “I guess Mom says no,” Joe thought aloud, eyeing the slope above us. He grinned. “Let’s see what Dad says.” Extracting an avalanche shovel from his pack, he dug a quick pit right there on the side of the slope. Data pits are also exactly what they sound like: holes dug in the snow to determine snowpack quality. According to Joe, a pit can never give you a green light; they’re meant to gather information but not to give you the go-ahead when other signs point to a no-go. Like teenagers hoping to extend our curfew, we were playing with fire: Mom had already told us no, and this time, Dad’s answer wasn’t much different. By the time we’d all made it to a rise overlooking our campsite, safe from the slopes above us, the mood in our party had shifted. We gathered just in time to watch a huge slide on a slope across the valley, and as the cloud of powder drifted toward us, the exuberance we’d felt that morning—finally out of our tents on a bluebird day in the Talkeetnas—dissipated. We’d been given a sobering reminder that the mountains would make many of our decisions for us. On the summit of Ama Dablam II. The rest of the trip went by quickly. Conditions didn’t allow us to slay or ski nearly as many peaks as Joe had hoped, but we did stand atop Ama Dablam II the next day, albeit having gotten there via a different route. 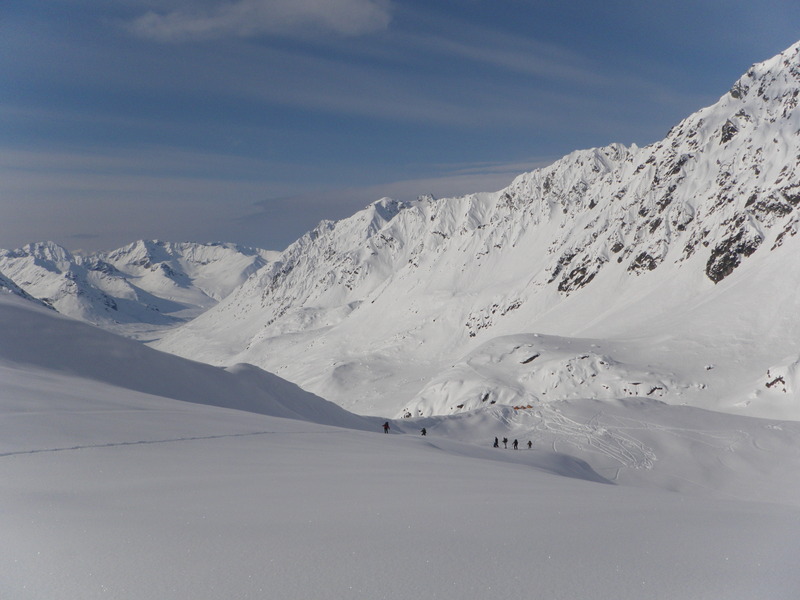 Soon enough, it was time to leave the Talkeetnas, and the mountain gods were kind enough to grant us a frozen crust upon which to ski the nine miles back to the trailhead rather than skinning them. We arrived in the empty parking lot and spread out our gear to dry as we waited for the vans, smellier but fitter than we had been the week before, and ready to traverse the Harding. I want to tell you all about crossing the land of ice and snow, but it’s sixty degrees in Alaska today, and I have to go outside. Stay tuned for Part 2, which will cover such topics as: pulling one’s companions from the icy depths of a crevasse, peeing through a funnel while roped to one’s teammates in the middle of a glacier, and hauling ninety pound loads over mountain passes.